Lira Chan, an owner of Mei Lai Wah Coffee House, does an early morning business in steamed pork buns. OBODY says much about Chinatown these days. Not Manhattan Chinatown, anyway. Flushing is where the excitement is, or Brooklyn. "You know," one Chinese-food maven whispered to me recently, "there are really two Chinatowns in Brooklyn now, Sunset Park and the Avenue U area near Bensonhurst, but nobody knows about that one." Lovers of Chinese food crave secrecy and are suspicious by nature. They are desperate to learn where the hot chefs are cooking, but fear they have chosen a restaurant where the great chef has already left. They are certain a restaurant's real treasures are denied to them because they can't read the proverbial Chinese-language menu. Long ago the writer Calvin Trillin said that he carried a card with the Chinese sentence for "Bring me what they're having at the next table." But the big secret in Chinese food these days is right out in the open, if only anybody were looking. It's Chinatown Manhattan Chinatown where the food, to my mouth at least, is as good as or better than it's ever been. It's not just the restaurants, although that's a pretty good place to start, but fish shops, meat markets, greengrocers and purveyors of things you never knew you wanted, like dried licorice plums, which doubtless have some health benefit but to me just smell good. Even while much of Chinatown may seem familiar, like the jurors flocking to Big Wong on Mott Street for roasted pork at lunchtime, it is constantly changing. Street vendors are now all over, selling fried turnip cakes on Canal Street, for example, and little fried-dumpling shops are springing up, offering the unbeatable deal of five for a dollar. New-wave Chinese restaurants like Shanghai Cafe and Big Eat cater largely to a younger crowd and offer glimpses of the latest crosscultural dining trends in Hong Kong. "It's still a really exciting place," said Mr. Trillin, who regularly rides to Chinatown on his bicycle from his home in Greenwich Village. "There's constantly something new there." Even with something old, you can learn something new and exciting. On a recent sunny afternoon, when I stopped at the Mei Lai Wah Coffee House, a worn and battered cafe practically hidden on Bayard Street, I found the dregs of the day's baking, a steamed pork bun that had sat around long enough to turn as tough as one of the listing vinyl booths. The place was empty and lifeless. 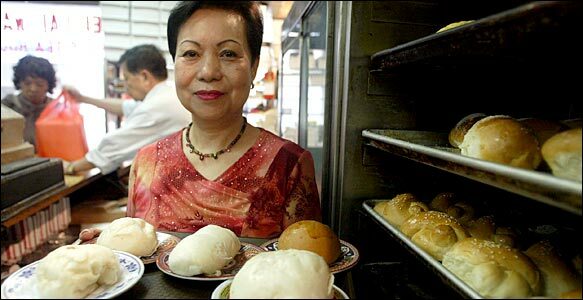 But when I returned in the morning, Mei Lai Wah was hopping, filled with men drinking coffee from paper cups as trays and trays of fresh buns were stacked in racks. The baked pork buns were superb, with a glossy, pliable pastry and a savory, slightly sweet filling, and just 60 cents apiece. A sweet braided sesame bun, still warm from the oven, was just the right chaser. Mei Lai Wah was there years ago when Chinatown was just a small clutch of narrow bends between Canal Street and Chatham Square. Chinatown's star shone brightest in the 1970's and 80's, when New York City's love affair with Chinese food was at its height. Woody Allen and Mariel Hemingway nurtured their doomed love affair in "Manhattan" over Chinese takeout containers while Edward I. Koch, the noshing mayor, was an irrepressible Chinatown habitué. College students from Connecticut I was one used to consider it an adventure to drive down after midnight to Wo Hop or Hong Fat, places where even the greasiest moo shu pork tasted great at 3 a.m.
Chinatown has grown tremendously since then, expanding to the north and east, reducing Little Italy to a quaint diorama as it has engulfed much of the Lower East Side. But it's no longer a big deal to many New Yorkers. It came to be taken for granted, diminished in the city's imagination by an expanding world of Thai, Vietnamese, Malaysian and Korean restaurants many of them in Chinatown itself. Like network television in the age of cable, Chinatown is now noted for what it lacks rather than appreciated for what it offers. Of course, 9/11 hit Chinatown especially hard, and so did the SARS link to Asia. But those events only accelerated the slide downward. "Life was tough there even before 9/11," said Leonard Lopate, the talk show host on WNYC radio, who lived in Chinatown for 30 years before moving to Brooklyn in 2001. "People now have all these other options. Food tastes have changed as well." And why not? The world has grown: people have seen, tasted and traveled more, and nobody, least of all the Chinese, expects to settle for the same old dishes. Cantonese, particularly by way of Hong Kong, is still the dominant style in Chinatown, though you can also find Shanghai, Fujian and even a little Sichuan, often all on the same menu. Bubble tea shops are proliferating, as are fancy bakery chains with as many French and Italian pastries as traditional Chinese delicacies. The Flushing and Sunset Park Chinatowns may have more Taiwanese or Sichuan restaurants, but they don't have Manhattan's variety. What they do have is parking. "Parking is such an issue, but I would not say the culinary attraction has shifted," said Wangsheng Li, who works for MetLife and is a frequent visitor to Chinatown. "The Chinese restaurants there have become more sophisticated in terms of trying new things." Consider, for example, the bizarre curry bun at Big Eat, one of Chinatown's shiny new restaurant-lounges. It's a hollowed-out roll as big as a jack-o'-lantern, filled with spicy, peppery curry tinged with coconut milk. A chicken leg pokes out the top like an umbrella in a stand. It's good, too, though it's not exactly clear what makes it Chinese. With other dishes like Malaysian curry, Thai pork chop, edamame, and a mysterious "baked pol bello mushroom and cheese rice casserole," Big Eat caters to the worldly tastes of its clientele. "It's an infusion of nouvelle cooking from China, and newly arrived chefs reflect these kinds of tastes," Mr. Li, a onetime restaurant manager, said. "The distinction between regional cuisines has become very blurred." The more traditional flavors of Chinatown are still easy enough to find and can be astonishingly good. At Chanoodle, a bright new restaurant on Mulberry Street, the fried rice with two kinds of Chinese sausage is a beautiful, colorful dish, putting to shame the grease bombs that pass for fried rice at the takeout joints. The green of the peas, the red of the cubed peppers and the bright yellow of the egg contrast with the white of the fluffy rice, and the sausages one dried, the other fresher add complementary pungencies. OK 218 Grand is a plain little restaurant alongside a takeout shop with excellent roasted meats served over rice, and surprisingly good Peking duck, served with graceful ceremony as a waiter swiftly anoints pancakes with hoisin and rolls them up with duck. "I still go to Chinatown all the time," Mr. Koch said. "But I feel so sorry for the people because the business is way off." One of his favorite Chinatown restaurants, Sun Lok Kee, relocated to Flushing last year after a fire at its longtime Mott Street site. "The rent was too high, and the restaurant was too small," said Sunny Lee, manager of New Lok Kee, as the restaurant in Flushing is now called. "In Flushing, more people are on the streets." That may seem difficult to comprehend for people who have dodged and parried their way up Mott Street, particularly on the block between Hester and Grand Streets, home to a fabulous selection of food shops. Here, one after the other, are greengrocers with neatly stacked piles of mustard greens, cabbages and melons, with baskets of shiitake mushrooms and Chinese pumpkins. Fish shops display fat striped bass, live blue crabs tied with cloth so as not to expend energy and lose body fat, buckets of squatting frogs and glistening little silver fish still breathing. Butcher shops offer every possible portion of the pig and cow. "To my mind it's the single best food market in the city," said Ed Schoenfeld, a restaurant consultant and longtime expert on Chinese food. "To me, it makes Arthur Avenue's covered market look like small potatoes." A block away, Peter Lam and his brother Joe Si, who own four Joe's Shanghai restaurants in Manhattan and Queens, have gone against the grain. They opened Joe's Ginger on Mott Street just a couple of months ago, reinvesting in Chinatown at a time when everybody else is counting it out. "9/11 and SARS and the parking, those three big problems, have killed a lot of business in Chinatown," Mr. Lam said. "We found a good location because we felt that next year the Manhattan economy will be better." Chinatown itself has taken steps to rebuild its business. In September, it cordoned off Bayard Street for a Moon Lantern festival, an unusual occurrence for a community that usually limits its celebrations to the Chinese New Year. There has been talk about improving sanitation and parking, although not everybody expects much to change. "There is lip service to community effort but I don't see it happening," said Michael Batterberry, a restaurant historian who is editor and publisher of Food Arts magazine. As with almost anything having to do with Chinatown, the more you try to understand, the less you realize you know. Things change for reasons that are difficult to discern, and don't change for equally unfathomable causes. Why is it, for example, that at least three well-known restaurants have changed their names slightly? Harmony Palace, a longtime dim sum specialist on Mott Street, recently promoted itself to Grand Harmony, while NY Noodletown on the Bowery performed a similar upgrade, becoming Great NY Noodletown. By contrast, the Triple Eight Palace on East Broadway knocked itself down a digit, and is now called 88 Palace. "Quite a lot of businesses have changed hands," said Ray Chen, an antiques dealer. "There's always this sort of thing."